Modernist architecture may seem brutal, simplistic, and crude at times. But its different schools of thought have produced plenty of masterpieces that are regarded as architectural classics today. 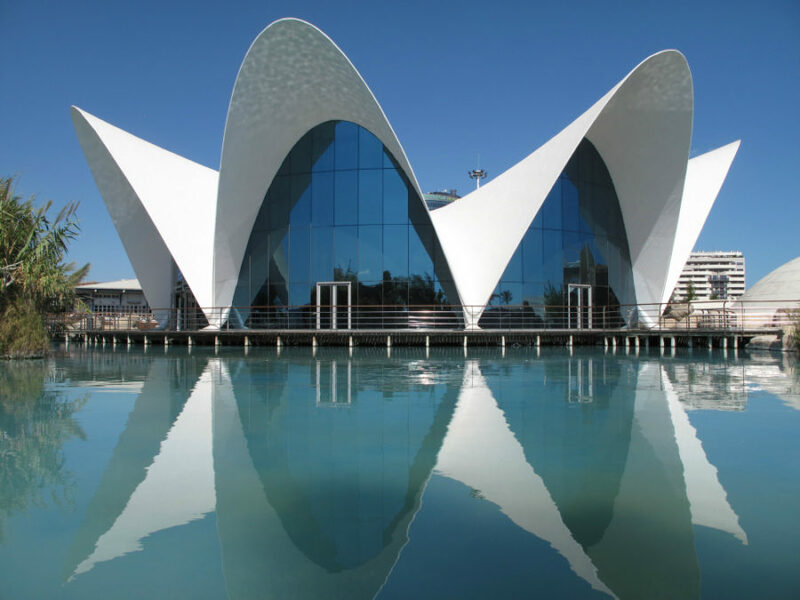 Take a trip around the world with our 30 stunning examples of modernist architecture that gave way to such incredible contemporary designs like Beijing National Stadium and Burj Khalifa. Guggenheim Museum is a work of the modernist Frank Lloyd Wright who followed a philosophy of organic architecture, such that worked in harmony with both environment and humanity. 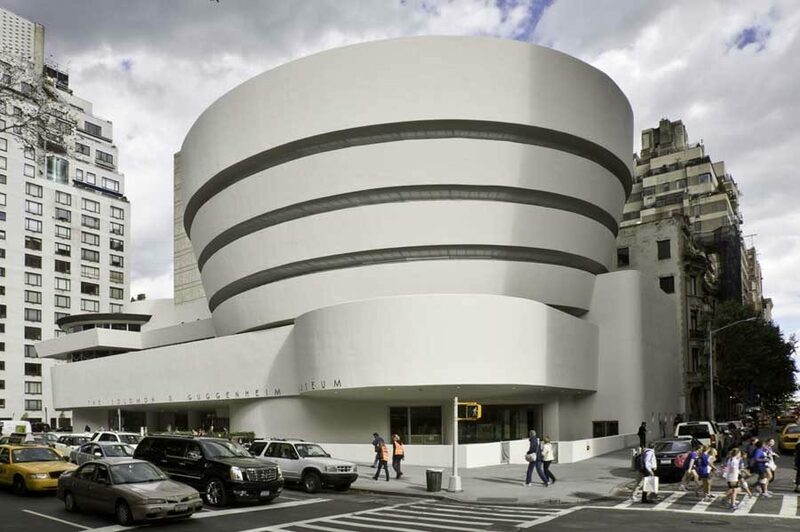 He designed more than a thousand structures including this New York Guggenheim Museum on Fifth Avenue. Solomon R. Guggenheim Foundation established in 1939 actually has a string of museums, but The Guggenheim in Manhattan is a modernist dream. 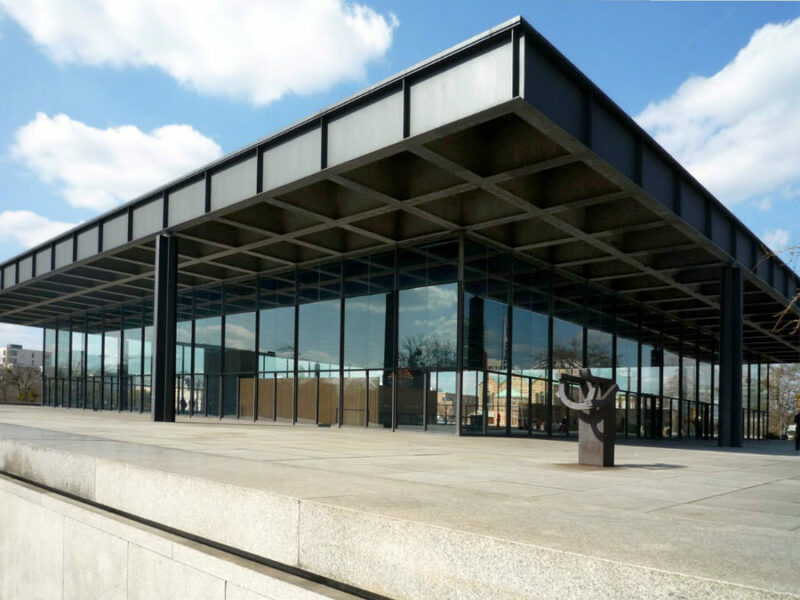 Neue Nationalgalerie designed by Ludwig Mies van der Rohe was opened in 1968 demonstrating a collection of early 20th century art in Berlin. 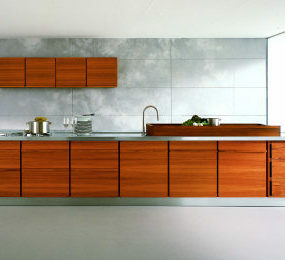 Its design is exactly how we see modernist architecture. 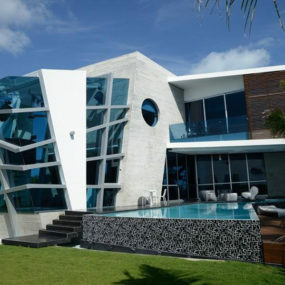 Tons of glass, flat surfaces, cantilevering roofs, and absolute minimalism. 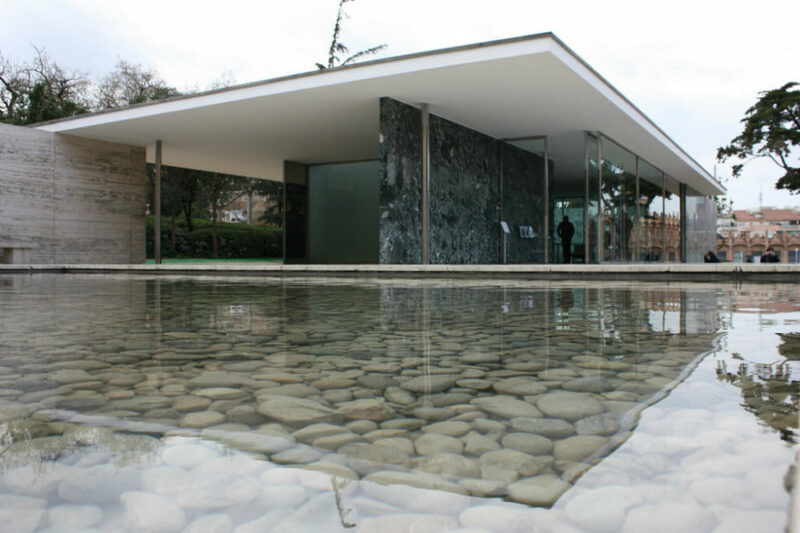 Though built almost a hundred years ago, Barcelona Pavilion looks like a contemporary house we see being built in droves today. Interestingly enough its cantilevering roof, glass walls, and indoor/outdoor spaces conquered homeowners of both post-war period and now. Representative of Bauhaus movement, the pavilion was built for the 1929 International Exposition using travertine, marble, and red onyx. It’s super luxe! 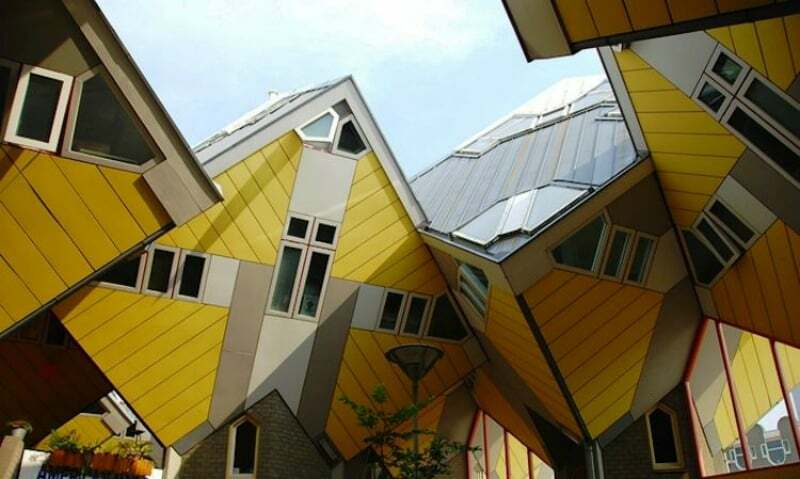 The Cube House or Kubuswoningen is actually a set of smaller houses designed by Piet Blom in the 70’s. It’s an entire complex of cubic homes tilted at 45 degrees and perched on hexagon-shaped pylons to create more space at the floor level. Creating a village within a city, Cube House makes for an interesting place to live. If you are in Rotterdam, you can rent a cube apartment through Airbnb and feel it out for yourself. 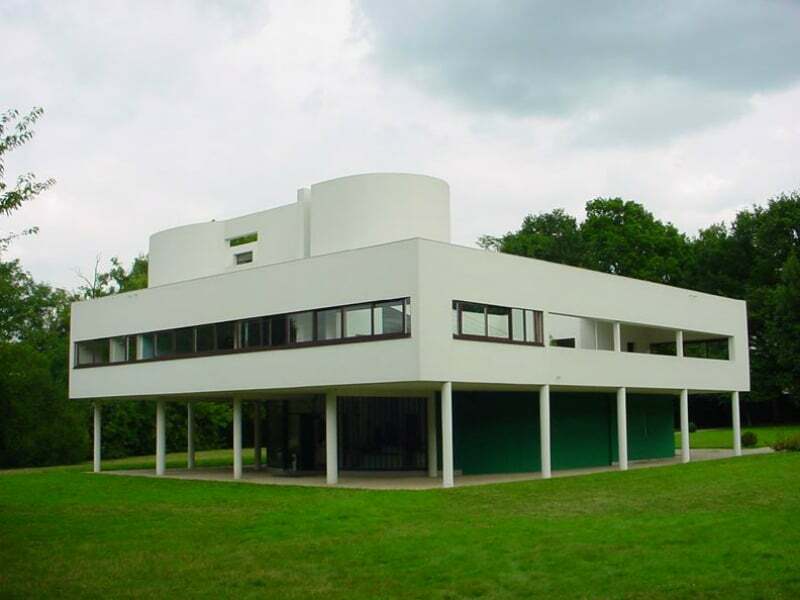 No article on modernist architecture would be complete without the Villa Savoye that is considered a classic modernist residence. Following the international style (no decorations, total minimalism), the renowned modernist architects Le Corbusier and Pierre Jeanneret went with simple lines and airy lower level created with the help of stilts. 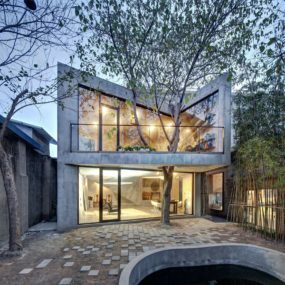 Transom-like windows cut through the boxy shape of the building while the circular roof additions house an outdoor lounge space and a roof garden. 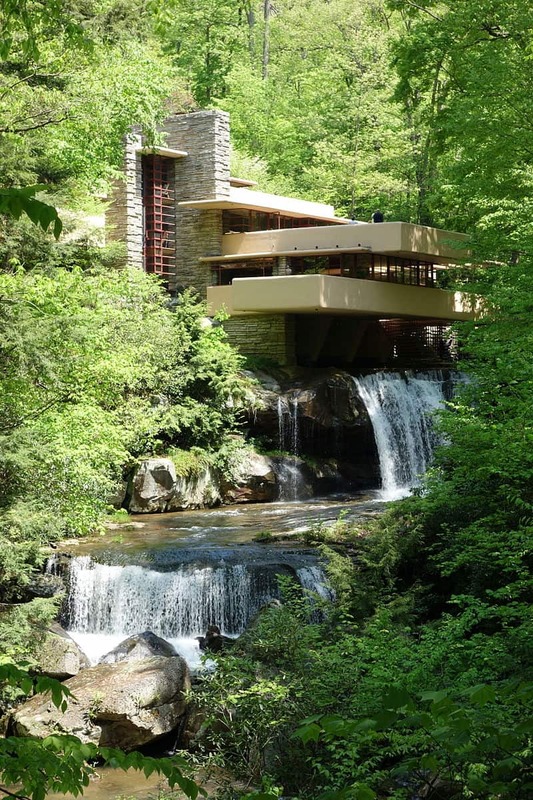 Fallingwater Residence is another famous work of Frank Lloyd Wright. It was built on a waterfall 43 miles (69 km) southeast of Pittsburgh as a weekend retreat for the owners of the Kauffmann’s department store. 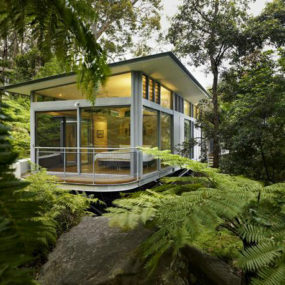 Featuring modernism’s favorite parallel lines, the house looks like a liner with white water waves poppling from underneath it, amidst the lush green forest. 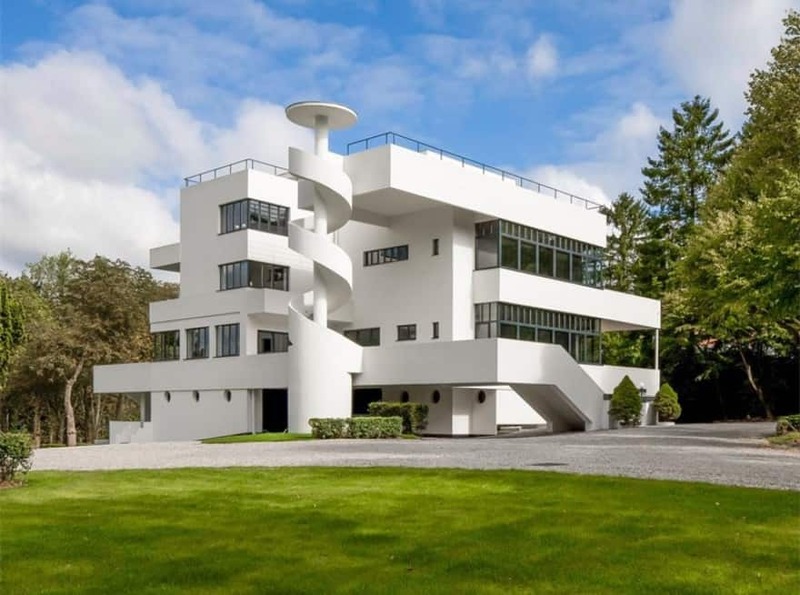 Built the same year as the French Villa Savoye, Villa Dirickz is too a gorgeous representative of modernist architecture. White concrete, blocky shapes, and generous glass inclusions instantly make it pop against the green landscapes like some kind of a ship. Listed at $10,000,000 last year, the villa offers luxurious interiors and amenities like cinema, wine cellar, and a separate cottage for its caretaker. 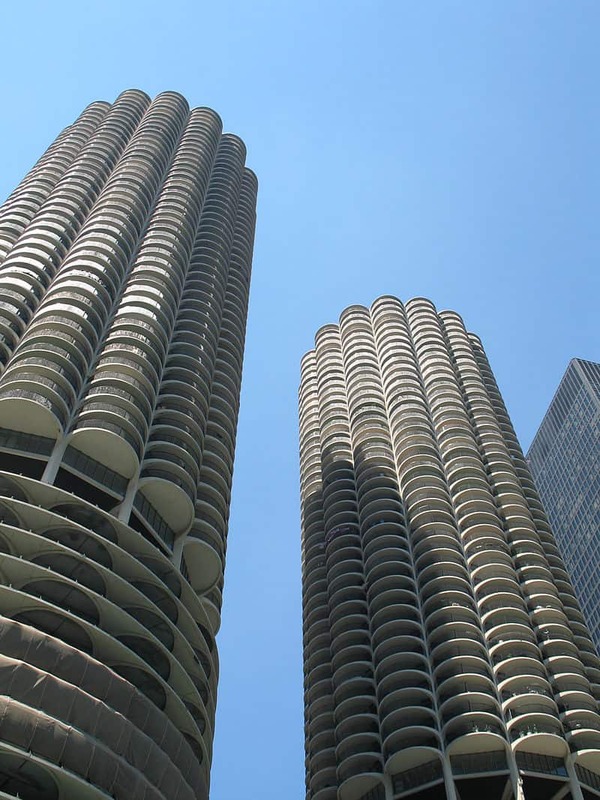 Chicago Marina Apartments have interesting history. Designed by Bertrand Goldberg back in 1959, the complex funded by the union of janitors and elevator operators was completed only in 1964. Besides the numerous living quarters both towers boast amenities like gym, theatre, swimming pool, bowlings, and restaurants – all of which cost around $36 million to build at the time. 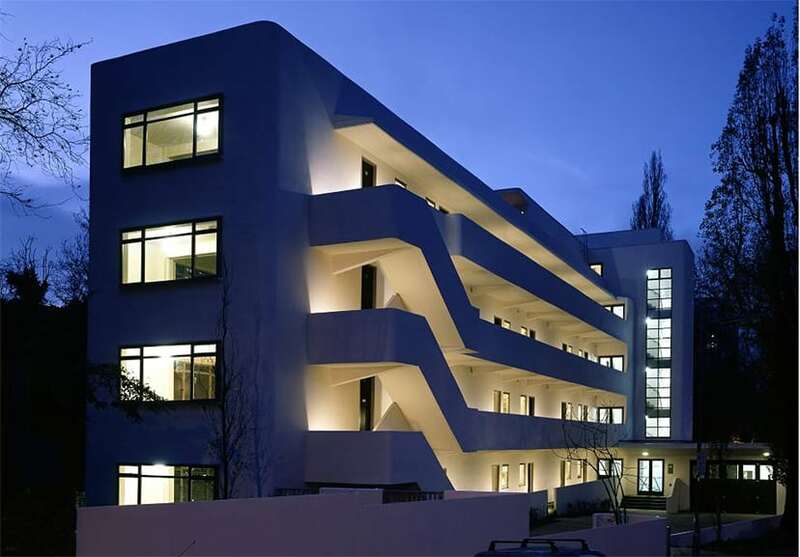 Isokon Building opened in 1934, comprising 34 flats and such amenities as shoe-shining and laundry. Combining streamline and modernism, the building is still being used as residential. Back in the day it housed intellectuals among which were numerous architects and Agatha Christie. 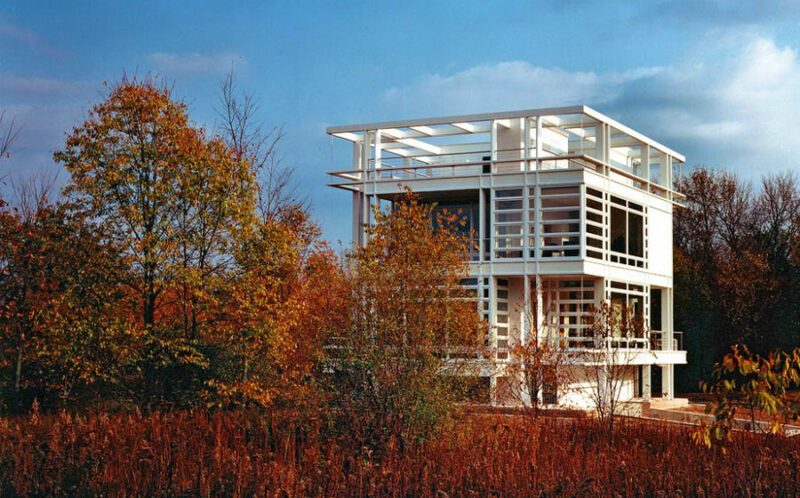 Continuing in his grandfather’s style Lohan Anderson built this perfect modernist retreat in 1992 among Michigan’s natural beauty. 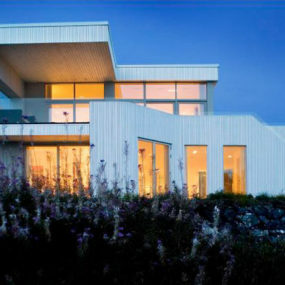 Even though it has a boxy shape, the design is complex and symmetrical, which brings some order to the beautiful chaos of the natural locale. 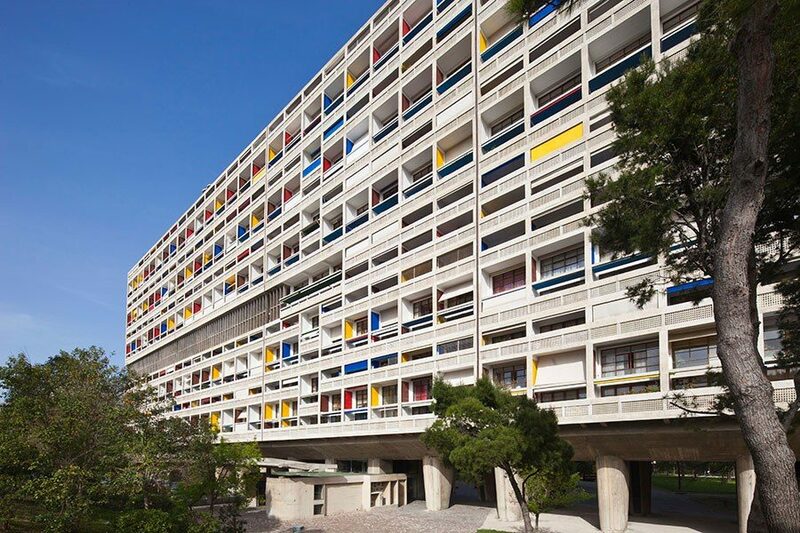 One of Le Corbusier’s fundamental works that inspired a lot of works of modernist architecture is The Cité Radieuse that was built between 1947 and 1951. 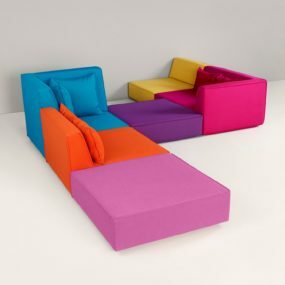 Though minimal, it features signature accents in a Bauhaus color palette (red, blue, and yellow). With 337 apartments of 27 types the residential building also boasts a paddling pool, a playground, and a roof terrace for lounging. Standing on the campus of Tunghai University, Luce Memorial Chapel, named after an American missionary of the late 19th century, is an elegant building. 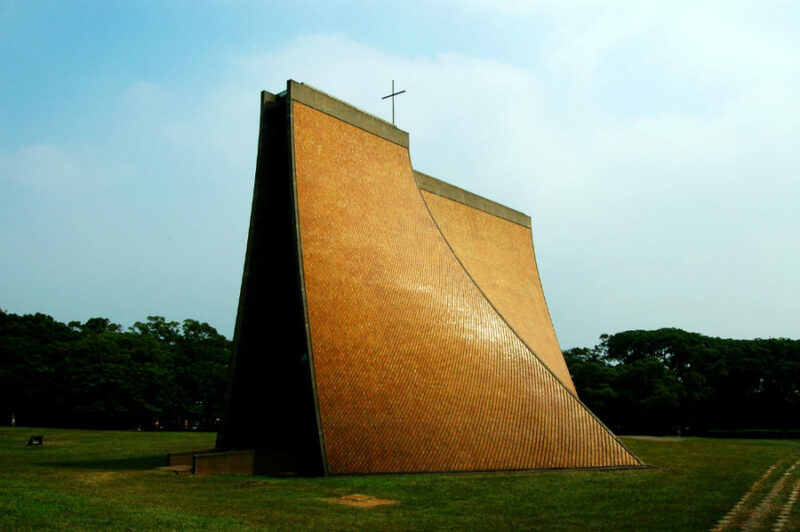 Designed in collaboration between architects Chen Chi-Kwan and I.M.Pei, the seemingly small but gracious chapel offers 500 seats under walls stretching 19.2m (62.9ft) high. The building that cost mere $125,000 at the time has a faint streak of traditionalism, but it’s got that much more from modernism including walls of glass and materials at 90 degrees. Chapel in the Rock is another name of the Chapel of the Holy Cross in Sedona. 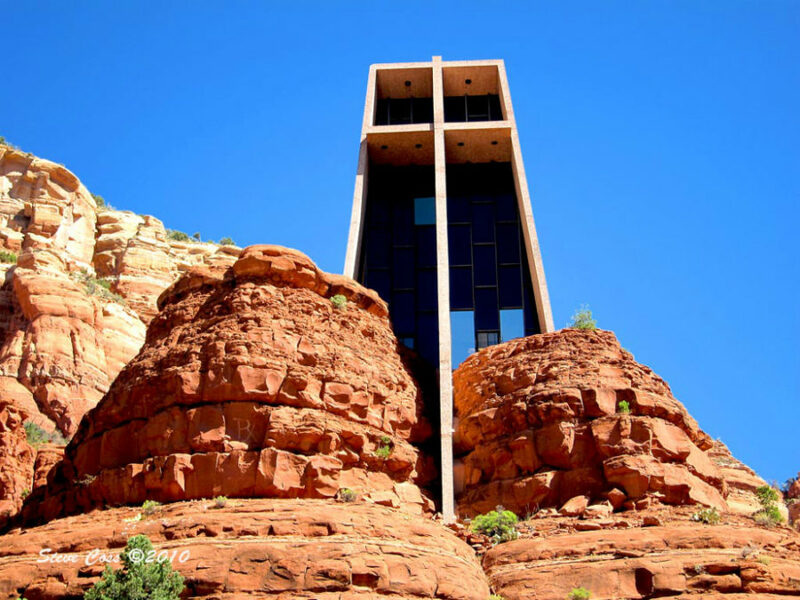 Designed by the son of a famous architect Frank Lloyd Wright, the chapel was supposed to be built in Budapest but was moved to Sedona at the breakout of Word War II. At the cost of $300,000 the slightly trapezoid building was carefully inserted between the rocks with its facade stately demonstrating its purpose. Classic modernism! 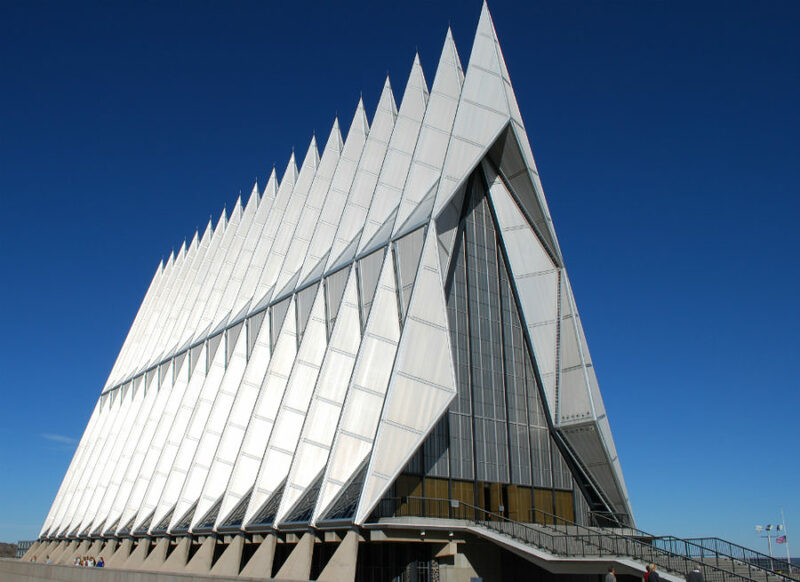 United States Air Force Academy Cadet Chapel conceived by Walter Netsch is located in Colorado Springs and stands tall piercing the sky with its 17 triangular spires. Comprising places of worship for Protestants, Catholics, Judaists, Muslims, and Buddhists the building also serves for various meetings. When you see the Tokyo cathedral it’s instantly recognizable as a place of worship, though, with a hint of futurism and a heavy presence of its modernist architecture. It’s probably because of the flying metal facade centered by a towering glazed focal point that resembles a cross. Sanctuary of the Divine Mercy in Kalisz was designed in 1952, but its construction began only in 1977. Completed another sixteen years later the sanctuary looks unusual even for the time of its conception. 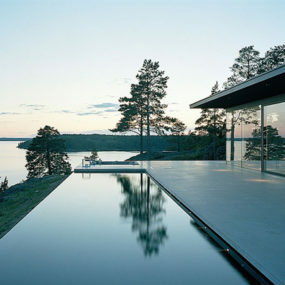 There are no familiar simple and minimal lines and shapes, only brutal concrete and a patterned metal frame of windows. 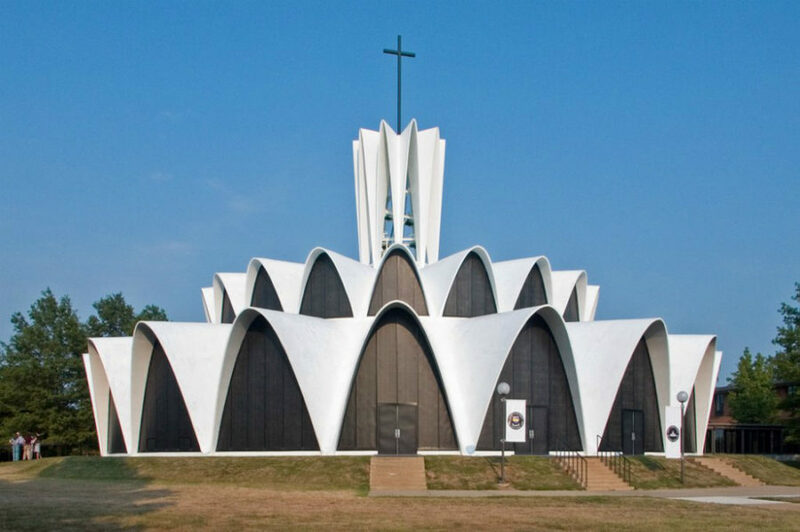 Resembling the design of one influential Mexican restaurant, Saint Anselm Church Creve Coeur built in 1962 definitely stands out among the rest with its ruffled collar shape. These ruffles create a very beautiful interior where circular seating benefits from the natural light flooding the halls and opening up to the green outdoors. 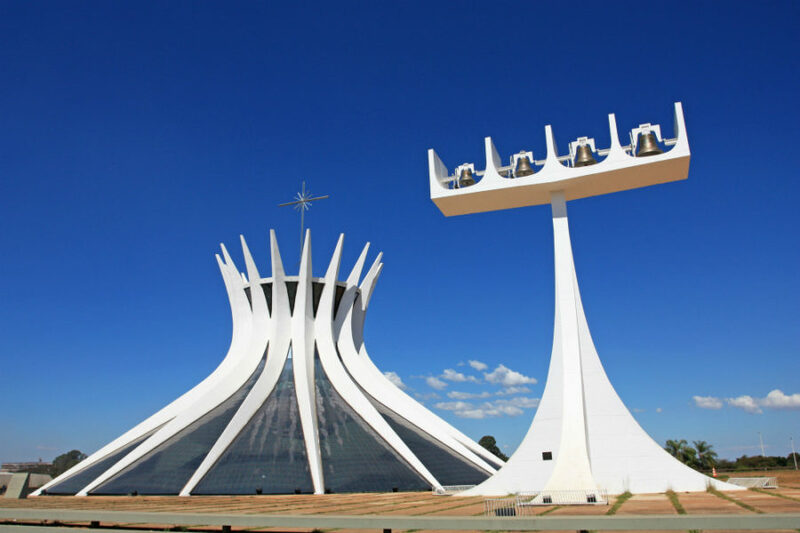 Brazilian modernist Oscar Niemeyer loved columns and curves, so for his Cathedral of Brasilia he created 16 concrete undulating columns forming a flower-like shape. The windows filling space between the columns glisten in the sun reflecting the cathedral’s white spires. From inside, however, they are stained with decorative patterns and drawings. 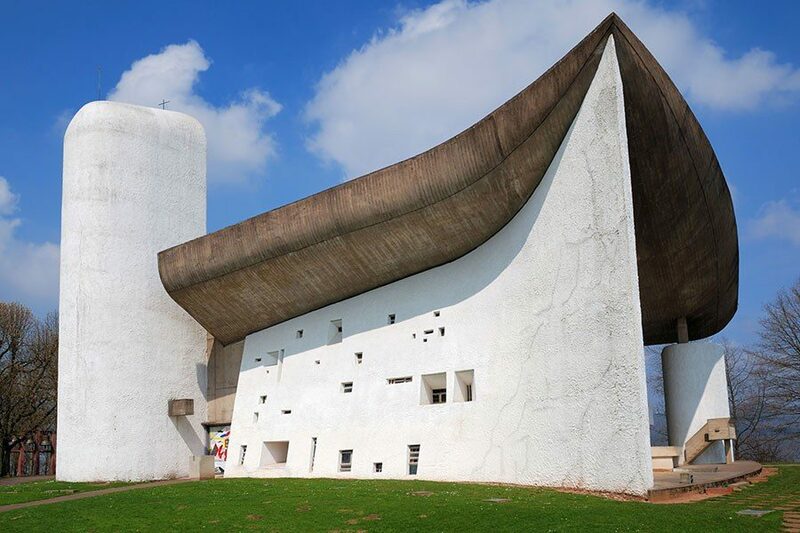 Notre Dame du Haut is one of the most significant works of Le Corbusier apart Villa Savoye, of course, as it changed the look of modernist architecture towards more curvilinear design. 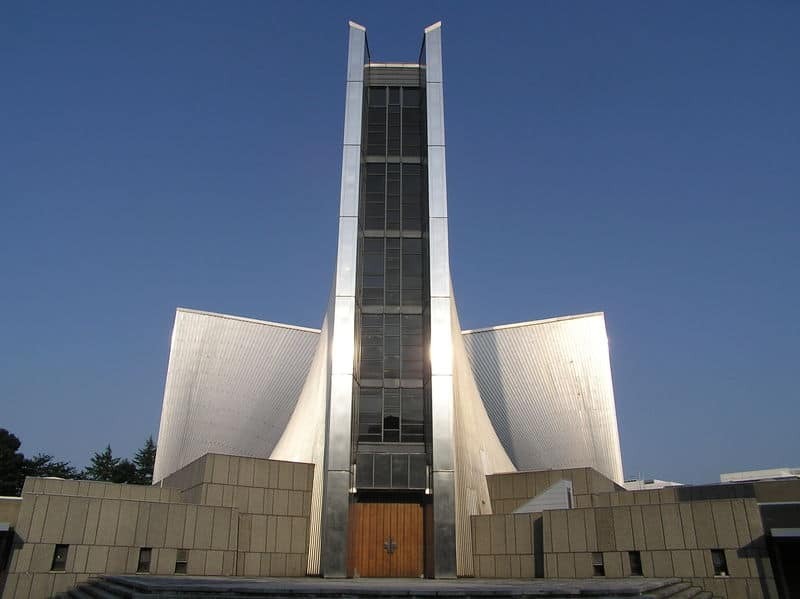 The chapel that was completed in 1954 features an unusual ship-like shape that signifies the architect’s late style. Unlike many other churches and modernist buildings in general Notre Dame du Haut has very minute windows sitting deep within the building’s thick walls. 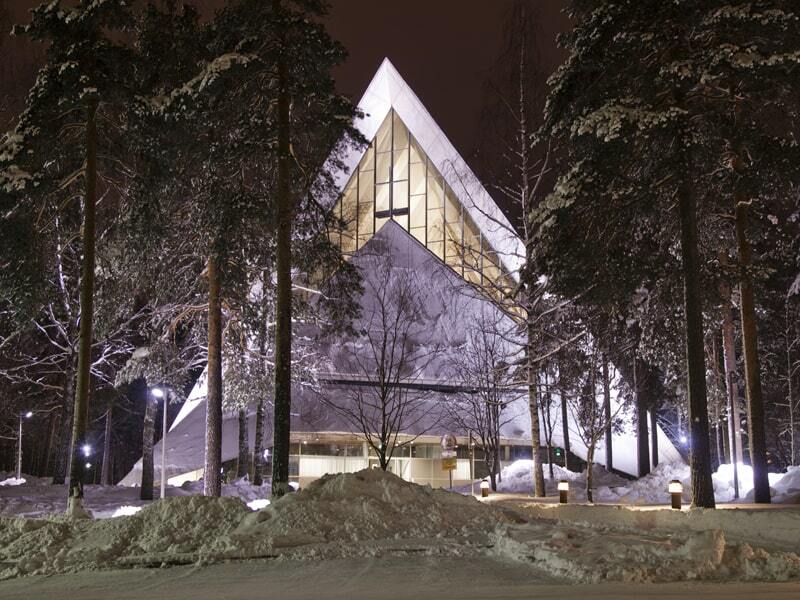 The New Church of Hyvinkää is serving the Evangelical Lutheran Church of Finland. 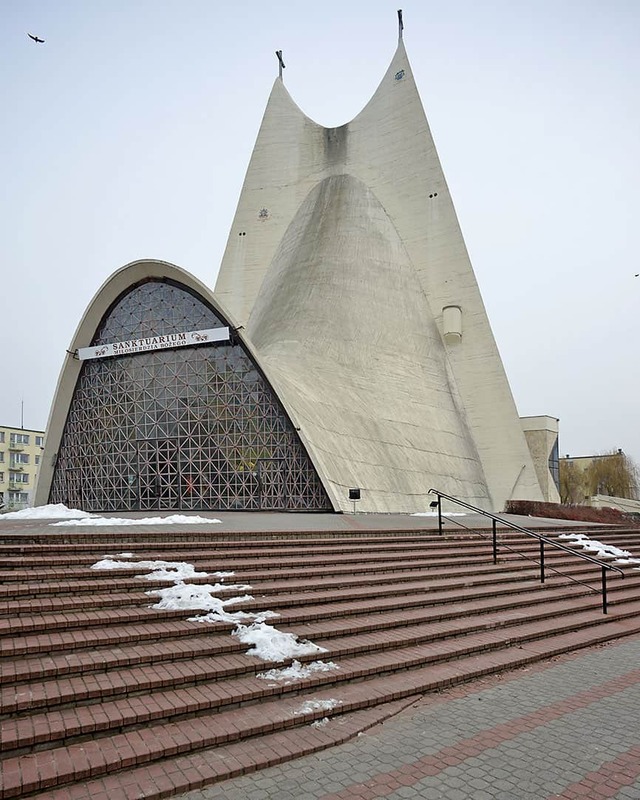 Built in 1961 the pyramid-like structure seats 630 people and boasts an organ with 35 stops. Hyvinkään shows off a church shape simplified. 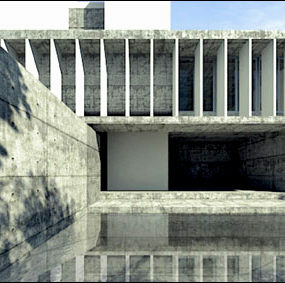 Its minimal triangular design while simple still symbolizes a place of worship. Yale Whale, as it is also known, looks more like a stingray with its curved roof and a cantilevering ‘tail’. 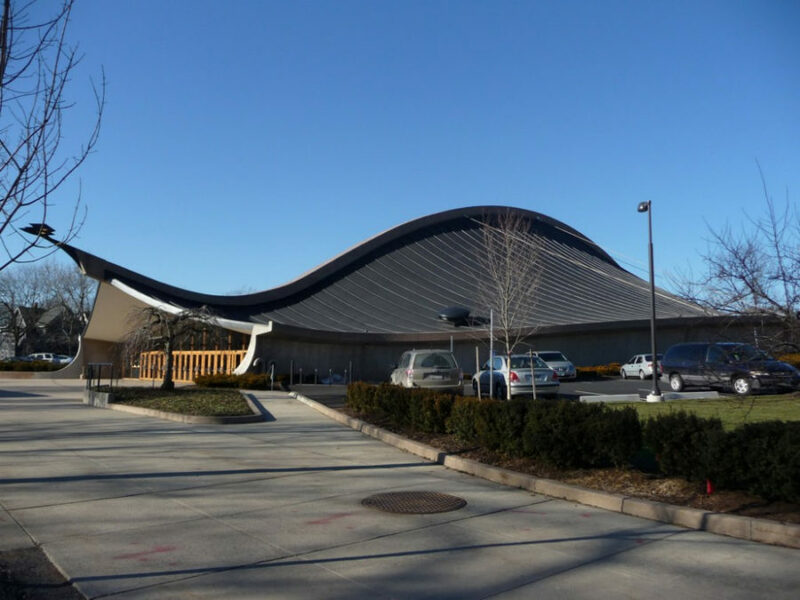 Built by a Yale graduate Eero Saarinen the hockey rink is both simple and complex in concept and execution. 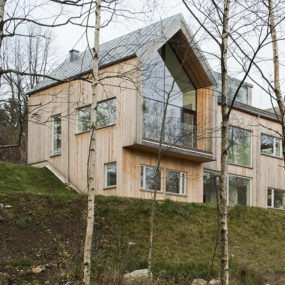 Complete with wooden finishes, its facade looks unusually inviting and homely. Still there is some majestic lively vibe coming from the design. Foire Internationale de Dakar looks like a modernist Mayan temple in the center of Senegal. Built in part as a pyramid the extraordinary complex is surrounded with boxy skyscrapers and general modernist minimalism. This reminds us of Frank Lloyd Wright’s Ennis House designed in a style of Mayan Revival but filled with modern minimalist sensibility. 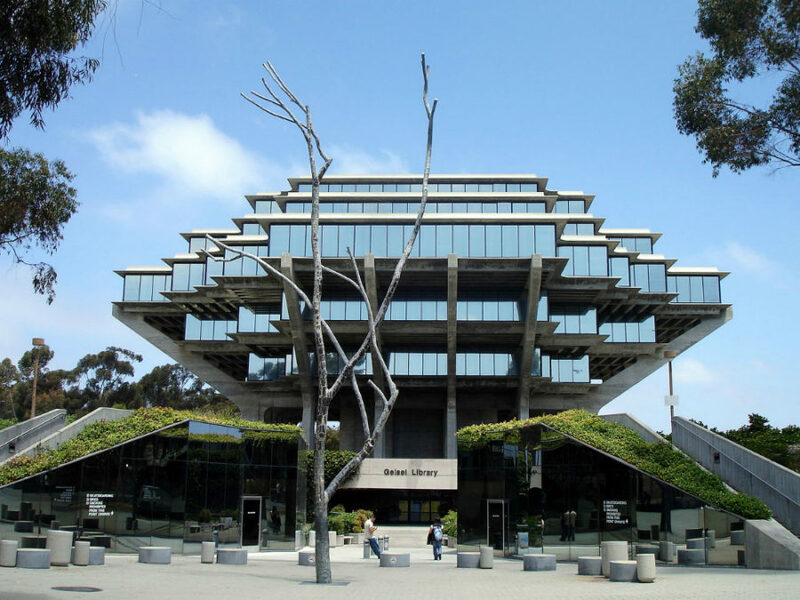 Geisel library started construction in 1968 and took $5 million to complete two years later. The looming work of William Pereira consists of multiple cantilevering levels that protrude and glistens with their smooth teeth of the wall-sized windows. With its 8 floors of space the library houses a collection of 7 million volumes along with a complete Dr. Seuss Collection. Started in 1948 and opened in 1952 the library of the National Autonomous University of Mexico (or UNAM for short) is one of the most interesting modernist architecture examples built in the middle of the last century. Not because of its unusual shape or style, though, but thanks to the colorful tile murals showcasing Mexican history. 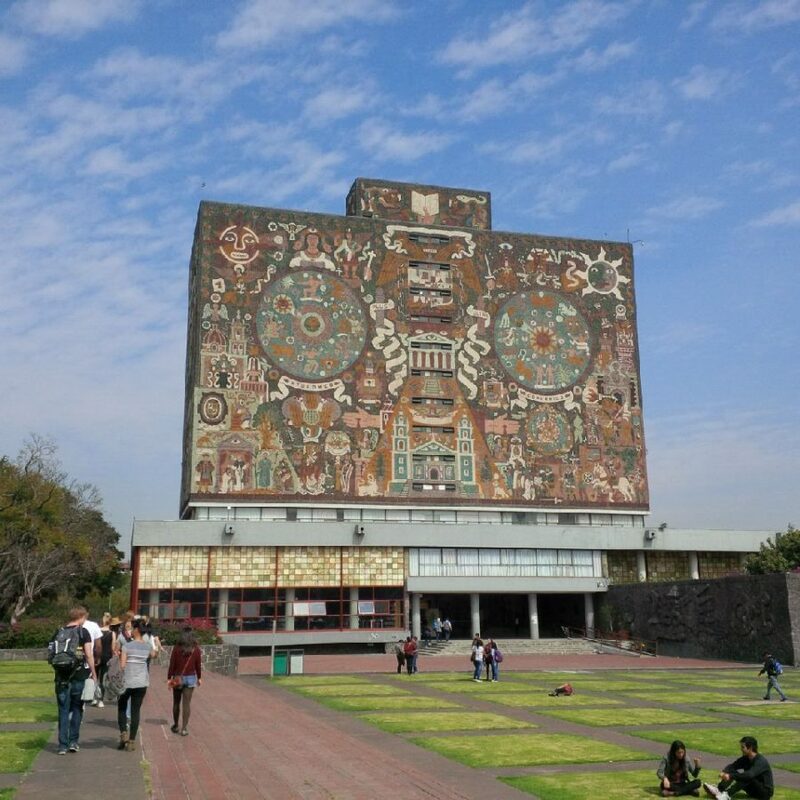 Proposed and executed by a Mexican painter and architect Juan O’Gorman the murals tell a tale of Mexico’s pre-Hispanic and colonial past alongside depictions of the contemporaneous world and the university itself. 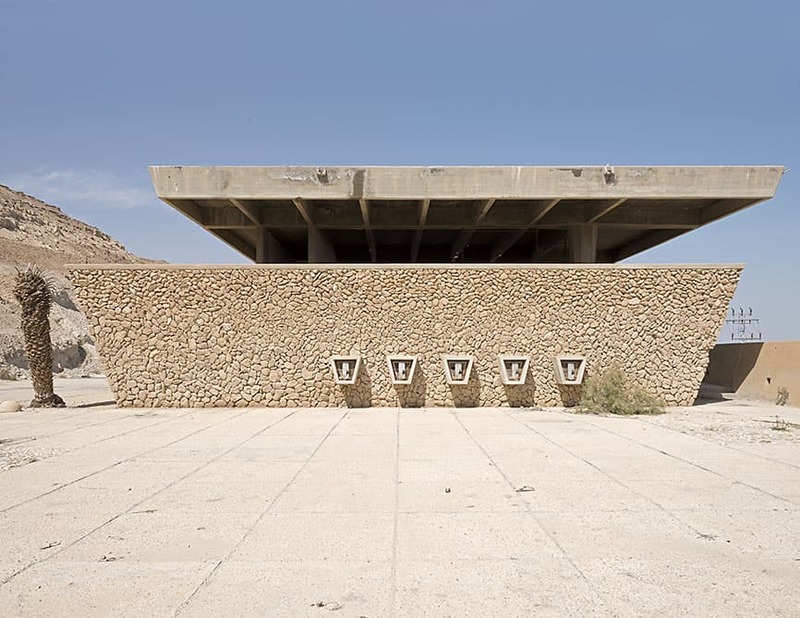 This abandoned Dead Sea visitor center is a modest yet expressive example of modernist architecture. Its trapezoid walls wrap around each other, creating a rather welcoming atmosphere that no one now enjoys. 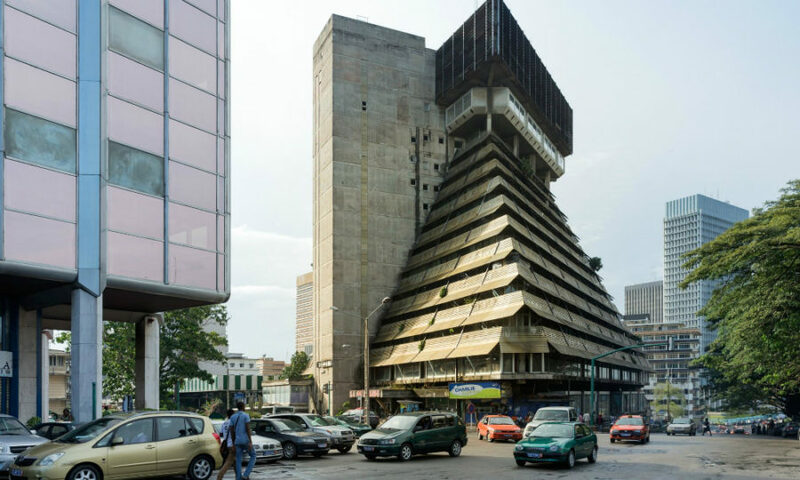 We can appreciate its restrained beauty thanks to a photographer Nicolas Grospierre who for the last 15 years was busy gathering an atlas of modernist architecture all around the world. In 1958 Felix Candela designed a masterpiece that would continue inspiring architects around the world till this day. His experiments with construction and thin-shell structures gave life to Los Manantiales, a restaurant in Xochimilco, Mexico city. Inspired by a form of a flower, the complex building consists of four intersecting hypars and blue glass windows opening up to a refreshing canal. Before Oscar Niemeyer fell for post-modernist style he earned a reputation as a modernist with his sleek designs, one of which is Palácio da Alvorada. 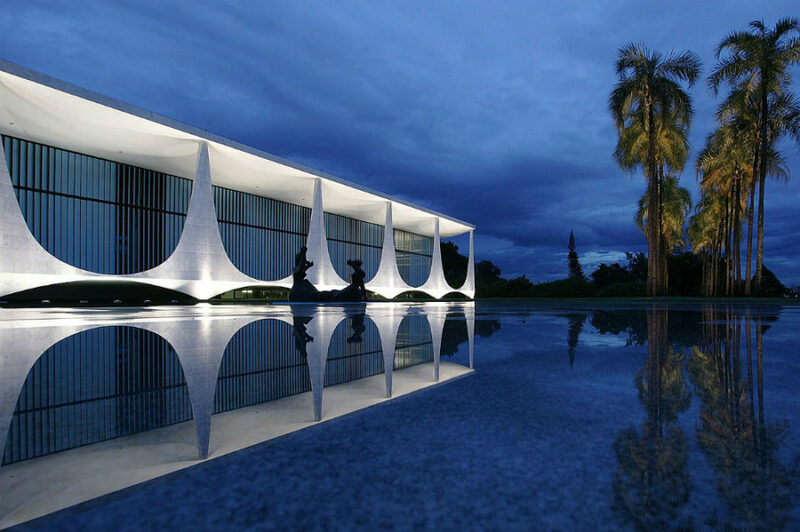 The official residence for the President of Brazil was built between 1957 and 1958. Sprawling across the area of 75,000 sq ft (7,000 sq. m.) the residence has it all including a movie theater, a game room, and even its own medical center. The adjacent buildings also comprise a chapel and a heliport. 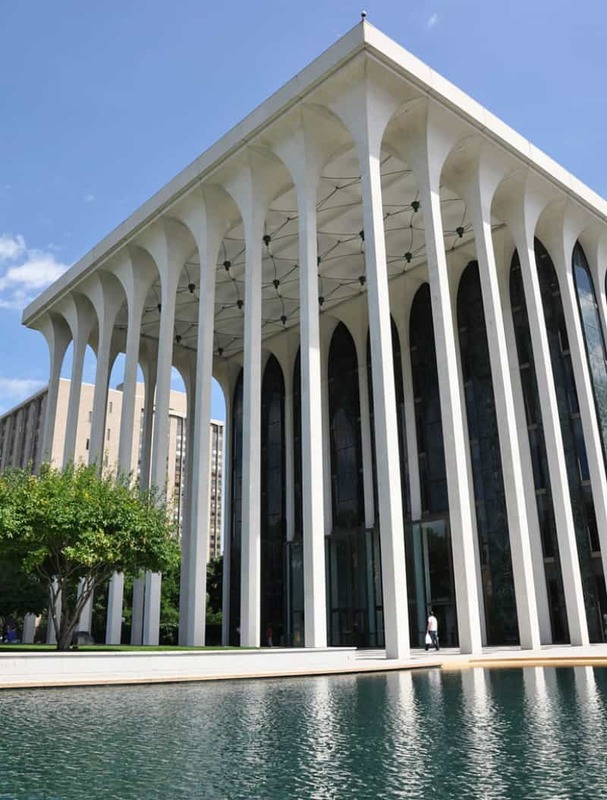 Northwestern National Life Insurance Building (now ING Reliastar Building) is a grand office block that echoes Gothic architecture with its beautiful slim columns and soaring arcs. Look past the facade (quite literally) and you’ll see elements typical of modernist architecture like glazed surfaces, simplicity of shapes, and open spaces designed for walking. 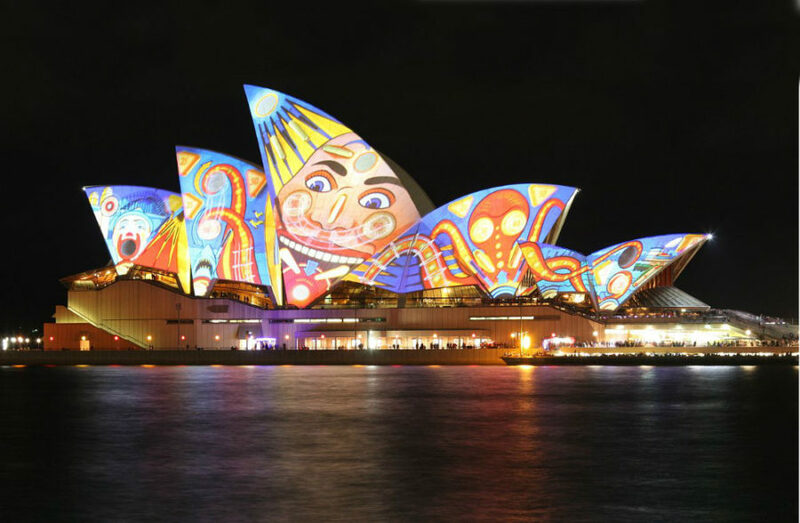 Classified as expressionist, Sydney Opera House was started way back in 1959 and completed only in 1973. Winner of the 1957 international competition, architect Jørn Utzon authored the venue and oversaw its long-lasting construction. Famous for its sail-like shape, the opera house includes multiple venues that host more than a million people annually. Though New York’s first skyscraper (Flatiron building) was designed in a style of Renaissance revival the rest came following the international style. 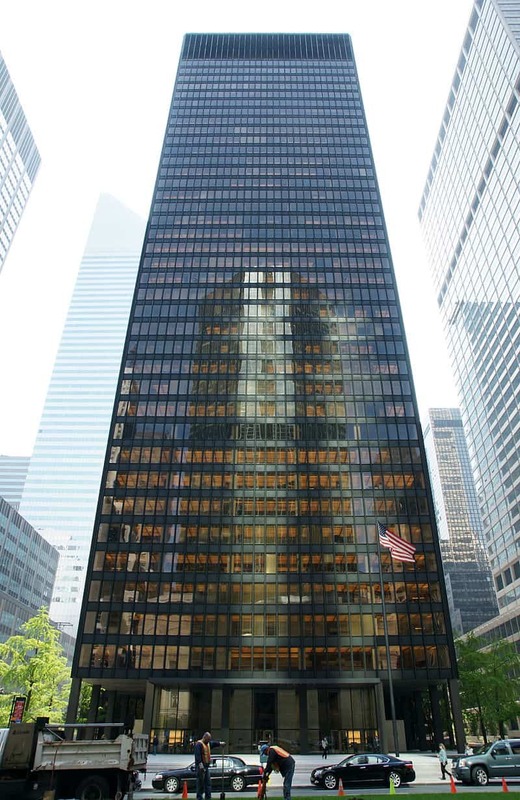 Seagram building completed in 1958 was pure modernism. Minimal, simple, and functional. Stylish jet black structure fits right with the New York’s modernist architecture, although lacks in contemporary eco-consciousness. Its 38 floors rate mere 3 out of 100 in the Energy Star rating. Modernist architecture comes in a lot of different forms from skyscraping boxes of New York to the futuristic saucer shapes of L.A. and Seattle. Embracing futurism, deconstructivism, and various other schools it still has a strong momentum in contemporary architecture. Love it or hate it, it gave us a lot of the buildings we have today.